Folding boat trailers offer you the flexibility of moving your boat around quickly. There’s no faffing about with Almac Folding Boat Trailers, you are looking at 4 minutes to get your trailer ready to go. With such a quick assembly time, why would you want anything else? You can get your boat on the road or into the water fast with a folding boat trailer. Forget dragging your boat down to the water; use a folding boat trailer, instead. These trailers are the most versatile in terms of ease of use, and are not too heavy to cart around. Weighing in under 40kg, folding boat trailers won’t bust your back when you’re attaching your boat into place. Because of this reason, folding boat trailers are the ideal solution if you are a tourer or caravanner. You may ask if folding boat trailers are sturdy enough for your needs? Other boat trailers may seem the stronger option, but Almac Folding Boat Trailers are just as tough as conventional trailers. Australian made folding boat trailers are made with marine grade aluminium. Believe it or not, such trailers have the capacity of moving up to 250 kilograms and a boat capacity of up to 3.8 meters. With a folding boat trailer, you can tow your caravan or camper trailer throughout Australia with ease. If you are short on space, folding boat trailers will best fit your needs. All boat trailers have their purpose, but if you are looking for a compact option, a folding boat trailer will be your best choice. Once you’ve towed your boat to where it needs to be, simply fold up and store away. The two fold trailer for example, compacts down to only 1.5m, the single fold trailer folds down to 2.1m in length. Folding trailers can be stored easily in the back of your caravan, on your roof rack, in the back of your ute or anywhere else it can fit. Folding boat trailers give you the easiest option of moving your boat around. 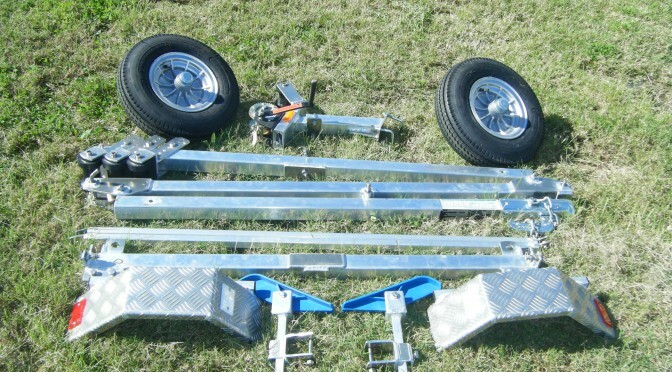 Such trailers are lightweight, easy to assemble and don’t take up too much room. This means you can carry your folding boat trailer around with you for when you need it. Folding boat trailers are the ideal solution for towing your tinny around the campsite or manoeuvring down to the boat ramp. You won’t need to worry about booking a campsite close enough to the water’s edge, so you can drag your boat down to it. With a folding boat trailer, you alleviate your tow troubles, and avoid putting unnecessary strain on your back, too! If you’re looking for a compact and easy way to tow your boat, or if you need something to move your boat around once its down from the roof, Almac folding boat trailers are the way to go. Want to know more? Check out the full range of folding boat trailers here, come and visit us at 46 Alexandra Street, Bundaberg, or contact our friendly team on 07 4152 3737.